Artist’s impression of Ledumahadi mafube. In the foreground is Heterodontosaurus, another South African dinosaur. The discovery of a new Jurassic dinosaur in South Africa shows that the transition from small, two-legged creatures to the thunderously huge long-necked dinosaurs wasn’t a straightforward process. Introducing Ledumahadi mafube, an early Jurassic dinosaur whose name means “giant thunderclap at dawn” in the African Sesotho language. The partial skeleton of this quadrupedal prosauropod, a distant relative of the giant long-necked sauropods like Brontosaurus and Diplodocus, was found sticking out of a cliff near Clarens, a town that’s close to the border of South Africa and Lesotho. This beast thundered across the early Jurassic landscape around 200 million years ago, which is about 40 million to 50 million years before the giant sauropods made their appearance. The lead authors of the new study, Jonah Choiniere and Blair McPhee from the University of the Witwatersrand in South Africa, say the discovery of such a large early Jurassic creature came as a big surprise. Some of the preserved bones of the newly discovered dinosaur, Ledumahadi mafube. Choiniere and his colleagues estimate that the adult specimen was around 14 years old when it died, and that it had reached its full size of 12 tons, or 24,000 pounds. 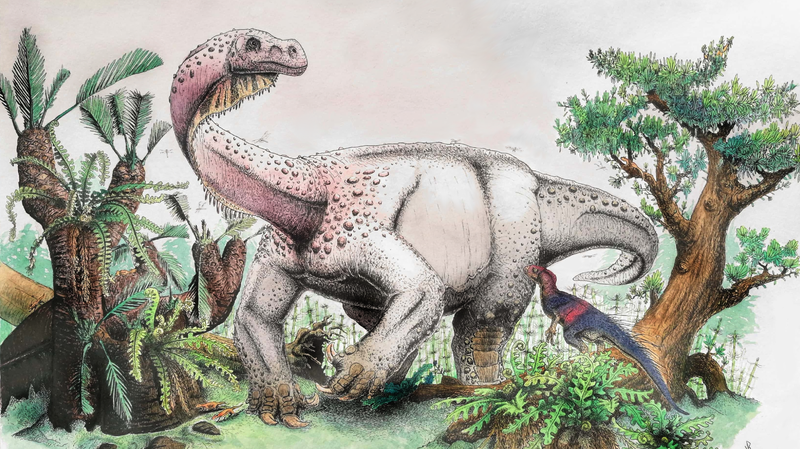 That’s a far cry from the 70-ton sauropods that would come later, but Ledumahadi was bigger than anything the preceding Triassic Period had to offer, like the recently discovered Ingentia prima, which weighed between seven and 10 tons. For comparison, the largest African elephants weigh around six to seven tons, so if Ledumahadi were around today it would easily be the largest terrestrial animal on Earth. This research team, a collaborative project involving scientists from South Africa, the UK, and Brazil, was also able to show that Ledumahadi was a quadruped, but it lacked the column-like legs that would appear later among the giant sauropods. The discovery of the four-legged Ledumahadi means sauropod evolution didn’t follow a straight, simple path, and that sauropods evolved four-legged postures as least twice. Steven Brusatte, a paleontologist at the University of Edinburgh who wasn’t involved in the new study, said the discovery of Ledumahadi is providing new insights into how dinosaurs evolved their gigantic body size. As a relative of Brontosaurus and Diplodocus, he said it’s not surprising to learn that Ledumahadi was a big animal, but because it’s a distant relative of the sauropods, and based on its position within the dinosaur family tree, Ledumahadi must have evolved its huge size independently of the sauropods. This means different groups of early dinosaurs were “experimenting” with different ways of becoming big during the first few tens of millions of years of their evolution, said Brusatte. Eventually, true sauropods stumbled upon their column-limbed design that was perfectly suited for supporting their large size, and “this is what enabled them to grow to sizes larger than Boeing 737s,” he said. In other words, it wasn’t sheer size alone that helped sauropods to become one of the most dominant dinosaur groups during the Jurassic. What those fortuitous adaptations might have been will have to be the subject of future work. In summary, this new study shows that sauropod-like dinosaurs evolved the ability to walk on four legs more than once, that the evolution of four-legged postures came before gigantic body size, that by 200 million years ago there were 12-ton dinosaurs walking the Earth, and that it wasn’t until the evolution of an elephant-like limb posture that true sauropods evolved and became so successful. Not bad for the discovery of a few bones, but the study is limited by virtue of this very fact. The never-ending search for dinosaur fossils continues.